We had the whole SOGO Hong Kong shopping centre to ourselves today and what a fantastic time we had! Together we discovered Hong Kong’s largest Japanese department store from top to bottom. SOGO started operations in 1985 and is one of the major shopping landmarks in the city for locals and tourists. However, it appears that most of the customers are from mainland China. Some of the shop keepers did not speak English or had a limited vocabulary. 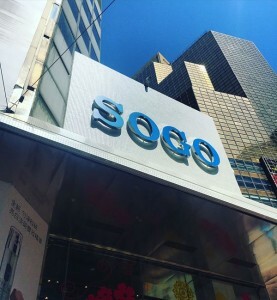 As the main clientele of SOGO are from mainland China, I am sure that everyone who works there is fluent in Mandarin. There are a myriad of goods from international fashion brands of clothes and shoes, beauty and cosmetics, children’s clothes, kitchenware, jewellery, electrical appliances, furniture and just about anything else you can think of. You will find a mixture of both Japanese brands and foreign imported goods. My favorite discovery today was the Japanese supermarket at basement level where we found rare and exotic fruit, vegetables and snacks. We spent an hour at Hong Kong’s SOGO shopping mall and we still didn’t see all 18 floors! However, a highlight from our scope was the tour of the variety of handmade iron teapots. They were all very pricey but the most expensive one was a 100 year old antique priced at over $618,888 (US$79,629)! A dozen strawberries imported from Japan…$200 (US$25) ! Thanks for your feedback. Have a great day! Thanks for your feedback. I have since started writing lots of content for you. Hope you come back and take a look at how we revamped the site. I will continue to look for interesting content to share with you that will hopefully make a positive impact on your healthspan. Stay in touch!